Sour dough bread is made by making what is known as a starter - this is flour and water mixed to form a soft, slack dough and leaving it for a week prior to requiring the bread. This starter is used as the rising agent and was the basis of breads for hundreds of years in many cultures. 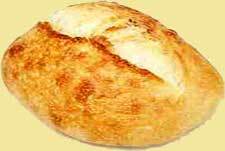 It uses the natural yeasts found floating in the air, that are captured by the starter dough. This is the bread many of our ancestors were used to, the style of bread referred to in the Bible, the bread the ancient Romans marched on and conquered the World with, it is simply the bread of legend. People who have experienced my sourdough breads, those that have had it in restaurants or specialist bakeries rarely go back to store bought yeast breads. Sourdough breads have a wonderful smell, a crispness of crust and a chewy texture and body that can only be described as pleasurable to the point of being illegal. It is so easy to make and the finish of one loaf means the automatic start of the next - as you will see from the following recipe. But it does require patience and time initially. If you want to make a loaf every day, you will have to start by making a starter every day of the week for a week. Labelling them so you remember which was made on what day and then using that starter to make the bread on the corresponding day the next week. Sounds complicated and a lot of fuss, but it isn’t and you will love the initial effort and it is worth the wait for the first loaf . . . a week for a great bread loaf is not too much to ask.